Trainer Danny O'Brien continued his love affair with Waikato Stud's ill-fated stallion O'Reilly as three-year-old filly Miss Adequate stormed to an effortless win at Bendigo on Sunday. Ridden by in-form hoop Daniel Moor, Miss Adequate camped just off the speed in running before powering away to record the classy win. "She is definitely city grade and maybe beyond," Moor said after the win. "She matured a lot from her past campaign and it was great today to see her put in such a dominant performance." O'Brien has produced three nice O'Reilly three-year-old this season - this filly as well as colts Sacred Sham and Bonville. 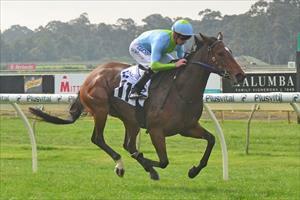 The trainer has also won Group 1 races with O'Reilly progeny Shamrocker and Shamexpress.